The use of mobile technology for tackling health issues has been a growing trend especially in developing countries. In South Africa for instance, the Dokoza system has been designed to fast track and provide critical care to HIV/AIDS patients and TB patients. 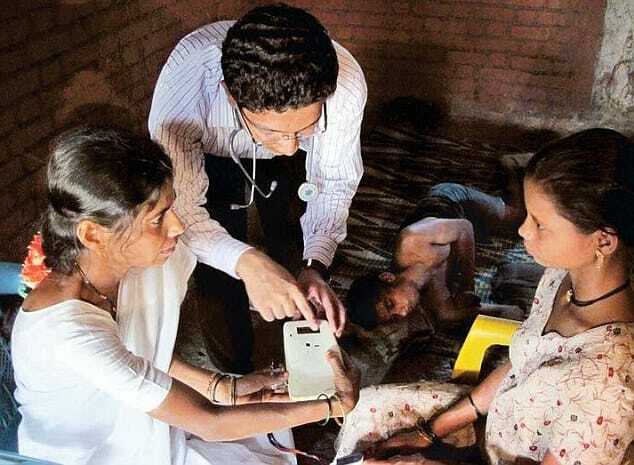 In recent years, the Government of India and other organisations have also adopted mobile technology to disseminate messages on key health issues in the country. The USAID with World Vision concluded a project in 2013 in Afghanistan where it found that the use of cell phones by community health workers (CHWs) with a Home Based Life Saving Skills application, and as part of a broader maternal and newborn care strategy, improved women’s health knowledge and use of health services. The study also found that when CHWs visited pregnant women, they used the mobile phone application to facilitate discussions about maternal and newborn health issues. According to the press information bureau of the government as of 2012, India is the second-largest mobile phone user with over 900 million users in the world. Recently the Times of India, TOI published a report which stated that the number of telephone subscribers in India increased from 931.95 million at the end of February, 2014 to 933.00 million at the end of March, 2014, thereby showing a monthly growth of 0.11%. This number is expected to keep growing. According to a report by Frost and Sullivan, India’s healthcare information technology market is expected to hit $1.45 billion in 2018, more than three times the $381.3 million reached in 2012. Reuters recently reported that India is relying on its vast network of telecommunications to reach places where health workers are not able to go. At the moment there are numerous organisations in India which have ongoing projects using mobile technology to improve health in the country. A partial list of the organisations is available here. Also included in the list, are projects being run by Intrahealth and funded by the Gates Foundation. Msakhi – an interactive mobile application disseminates 65 key health messages on prenatal and delivery care, postpartum mother and newborn care, immunization, postpartum family planning, and nutrition using a combination of text messages, audio, and illustrations all contextualised with localised illustrations and dialects. The project is at the moment being run in UP. We recently interviewed Mr. Gopi Gopalakrishnan, the President of World Health Partners (WHP). He has over 20 years of experience in implementing large-scale service-delivery programmes in low-resource settings. WHP uses its strong network base called the Sky Social franchise to help deliver essential services in some districts of Bihar and Uttar Pradesh. The Sky network consists of a bottom level of SkyCare Rural Health Providers and the higher tier Sky health centers. SkyCare informal health providers already live in the villages and are identified and selected based on their entrepreneurial and social skills. WHP equips them with training and low cost mobile solutions that enable them to perform tele-consultations, referrals (usually to SkyHealth Centers), and diagnostic, symptom based treatments. SkyCare providers charge for their services and earn a commission for each referral. There are also organisations like Dimagi that are propagating the use of technologies that have been created by them some of which include applications to track the supply chain for medicines. The MOTECH suite and platform run by the Grameen foundation has found a lot of success in Ghana and now is partnering with organisations such as CARE, WHP and the BBC in Bihar(Ananya) are building on the MOTECH Platform to improve the effectiveness of healthcare workers and to educate patients. The Ananya project in Bihar so far has been showing positive results in the rural areas of Bihar and it looks at combating four major diseases of pneumonia, childhood diarrhoea, Kala Azar and TB. The implementation of technologies such as mobile phones are a cost-effective method to connect clinics in the cities with those in the rural regions. The ability to reach women and children in hard to reach areas is easier with the use of this technology and if used to its potential, as it could really help improve India’s health indicators in the next decade.